The fact is, internships can be a crucial part of every job seeker’s resume. Not only can full-time jobs be hard to come by in this economy, but an increasing number of companies are offering internships as a way to see if an applicant will be a good full-time fit down the road. If you are able to snag a coveted internship, make sure you’re putting your best foot forward and avoiding some of the most common pitfalls interns can fall into. 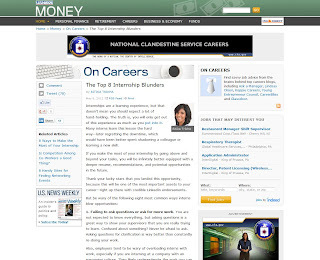 Ritika Trikha, of U.S. News & World Report, asked for my perspective for her article about the biggest mistakes interns can make. She shared eight common blunders every intern should avoid if they want to make a positive impression. To read my recommendations and get more tips to make the most of your internship experience, click over to Ritika’s article. What have you learned from your own internship experiences? If you have more advice to share with other students, leave it here in a comment!